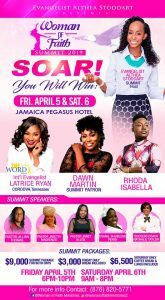 Friday and Saturday, April 5 and 6, 2019 at the Jamaica Pegasus Hotel. 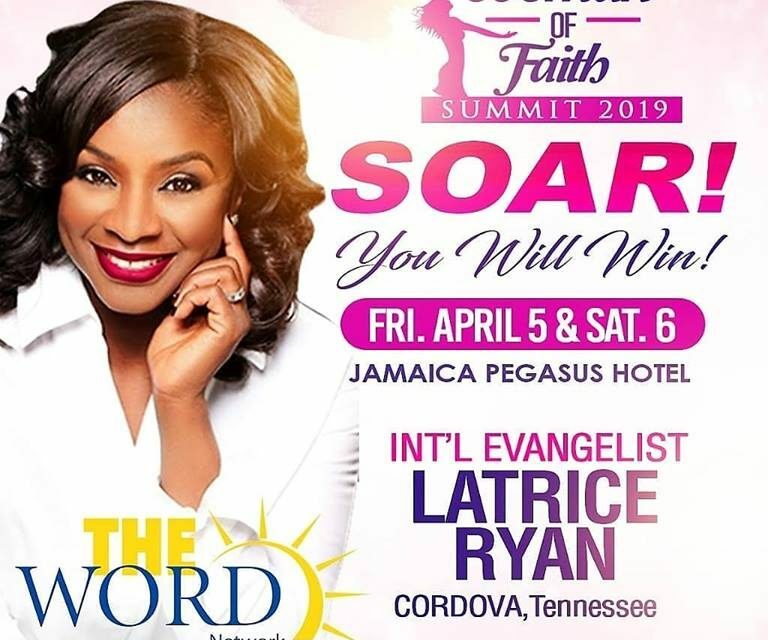 Come see International Evangelist Latrice Ryan from Cordova Tennessee, Dawn Martin, Rhoda Isabella along with Pastor Jillian Thomas, Pastor Jasette MacKenzie, Pastor Janet Allen, Evangelist Shurlene Perry and Success Coach Nathalie Taylor. 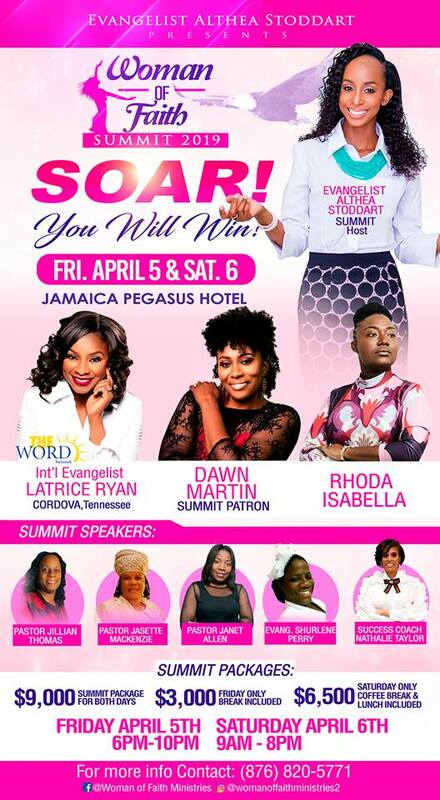 It promises to be an uplifting and fulfilling event, summit Packages start from $3000 to $9000. 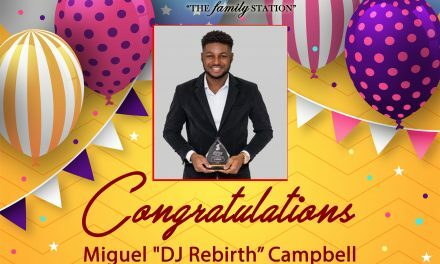 Tickets are available at Emmanuel Apostolic Church – 12 Slipe Road Tel: 876-948-3321. Chik N Trendy – Central Plaza Shop 21a, Tel: 876-544-9002. Gloria’s Seafood City – Victoria Pier Building, Ocean Boulevard Downtown Kingston Tel: 876-619-7905. Genus Pharmacy – Portmore Mall Tel: 876-988-1665. 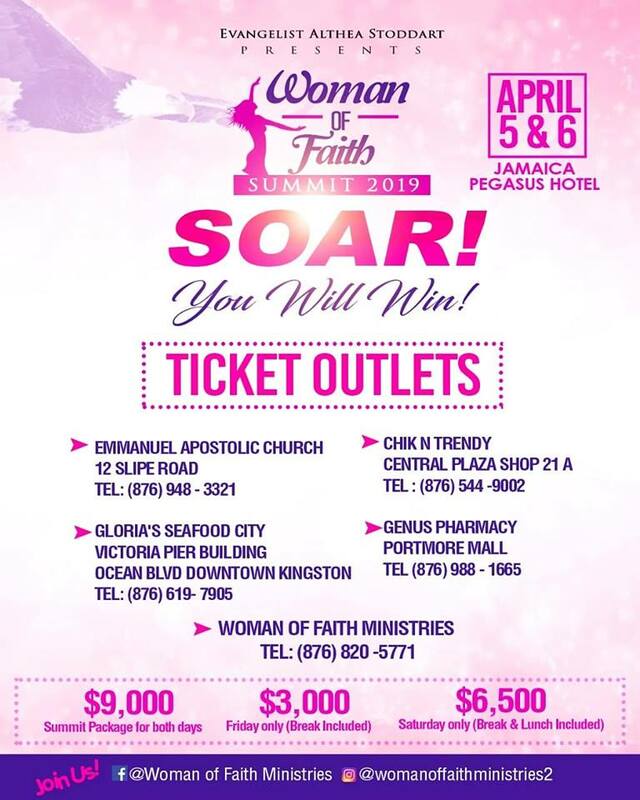 Woman of Faith Ministries, Tel: 876-820-5771. The event starts at 6 p.m. to 10 p.m. on Friday, April 5th and 9 a.m. to 8 p.m. on Saturday, April 6th. 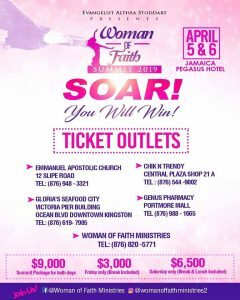 Inspiration and Motivation are two things you can never have too much of so come and get ready to SOAR to new heights.